I was talking to a friend, a horse trainer, on the phone the other day and he made a statement that I have been pondering ever since. He couldn’t quite put his finger on why the great ones were great but he thought an undefinable “something” made superstar futurity horses. We discussed the subject a little more and I came to the conclusion he might be right but I think that "something" is the six inches between the ears - the horse's, that is (although it's a given that the space between the rider's ears should not be a vacuum either). Training a horse to competive level for his futurity year as a three-year-old is a huge commitment on the part of the rider and horse. Of course, the horse does not really commit to the goal - he is talked into it. The staggering mental demands on a young horse in a futurity program cannot ever be underestimated and only the mentally strong horses will accept and even thrive with the challenges. For me that is the undefinable something that separates the great from the good. I'm just putting the first few rides on my two-year-old filly, Wildwood Mistral. Is she a futurity prospect? Absolutely. Will she be great? Possibly. With a good training program and three older brothers performing opening numbers for her (Running With Wolves, Wildwood Liberty and Walking With Wolves - all futurity horses), she has every chance of excelling, but I don't know for sure 'cause, as my friend says, "Futurity horses might just happen." Feb 3, 2011 -Wildwood Mistral trying out the saddle and bride. Last Saturday I baked bread. Since I have baked my own bread all my life, that was hardly a momentous occasion but, for some reason, I thought beyond the almost-automatic steps (setting the yeast, mixing the sponge, kneading, punching down, kneading again, etc). Maybe it was the bread pan. If that big old blue enamel pan could talk, what a story it could tell! It's no ordinary bread pan. First of all, it's big - the kind of bread pan every housewife owned and used a generation ago when making your own bread wasn't just the "getting back-to-our-roots" thing to do. It was the only way the family would have bread! My bread pan, you see, is the same bread pan my mother mixed bread in. She gave it to me when I was married (not sure what she used then because she still made bread...) and that pan has travelled with me from Saskatchewan to B.C and moved with me several times in this province. Now it resides on a shelf in my basement in the Chilcotin. I used to bake a batch of 10-12 loaves every week but now, living alone as I do, I bring it out only a few times a year. I am spoiled now - I do not like anything else. My bread pan with a batch of rising whole grain bread. That pan has baked more batches of bread, buns and cinnamon rolls than I can envision. When I do imagine the loaves that emerged from the pan, I imagine them filling every room in the house and overflowing into the yard. From the Diamond Dot Ranch in Saskatchewan to the Chilcotin plateau in British Columbia, that bread pan keeps on giving. The base is slightly dented and there are a few rusty spots on the outside; the lid doesn't quite fit any more from jostling around in moves, I suppose, but it still does the job better than anything else - plus it holds a really big batch! I still do everything the old fashioned way. I set the yeast in warm water with a little sugar in it even though it's fast-acting yeast. I still mix a "sponge" (works great because it rises to a bubbly mixture while I do morning feeding), and I still let it rise twice before making loaves. I guess I'm a creature of habit but why mess with something that works? Oh yes, I don't use a recipe either. The only thing that is an exact science about making bread is the amount of flour and that is measured by feel and texture, not an amount. I tried to write out a recipe for my daughter once, but she learned more by helping me anyway. Benefits of homemade bread are many - better tasting, cheaper and healthier but making bread is also a great way to work out frustrations if my day is not going well. The harder I work at kneading, the better the dough and the better the bread. Bread. Regarded as the staff of life. I'm not sure how that started except, of course, it a very basic food. I do know, that the aroma of fresh-baked bread cannot be equalled - incredibly invigorating, comforting and homey. "Breathing" the staff of life. Yes, I could believe that. Today is Valentine’s Day, a day of chocolate, cinnamon hearts, heart-shaped cookies, candy and cards . . . and roses. 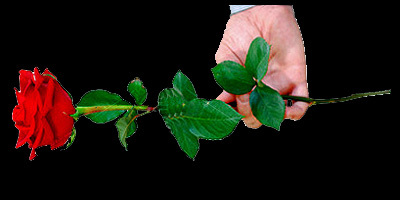 Several years ago, on Valentine’s Day, my husband brought me twelve long-stemmed red roses. There had not been many times in my life when I had received flowers. I was flattered, but it didn’t have to be a dozen. One would have meant just as much. I will never forget a scenario I watched unfold in Seattle airport a number of years ago as my husband and I waited on the benches for our flight. We were a little bored as one gets in airports. Don read a little, then almost fell asleep. I people-watched. One young man captured my attention and, as I so often do, I began to speculate on the story behind the man. He wore faded jeans with frayed, worn holes at the knees, a sleeveless T-shirt exposing tatooed arms, and a bandana tied around his head. He was nervous. He couldn’t stay in one place long. He fidgeted. He paced. He sat down. He got up again. But that was not what made me notice him. It was the rose. In his hand, he gently held one long-stemmed red rose. The incongruity of the picture struck me first. From his dress, I would have guessed him to be a cocky, devil-may-care young man, but his demeanor said otherwise. And he was obviously waiting for someone special to get off the next flight. The rose changed positions as he did. Sometimes he carried it close to his heart, sometimes loosely in his hand like he didn’t know what to do with it, but the scene that stays with me is when he stopped pacing and stood, back to the wall facing the gate. He brought his left leg up and placed it on the wall behind him as if to steady himself and placed the rose beside his right cheek. He was still for a moment, very much in his own world. And that world included someone very special to him. Now I was waiting for whoever was going to get off that plane too! As the passengers filed through the arrival gate, the young man shifted his pose and became even more anxious. Finally, a pretty young girl with an older man (her father? ), came toward him. Still shy, he gave her the rose but they didn’t hug or kiss. They exchanged a few words and the three walked off, leaving me touched in a way I couldn’t quite explain. I turned to my husband. "Did you see that?" I asked. "What?" he replied. He had missed the whole thing, but I have a permanent, perfect photograph in my brain . . . of a young man in a bandana leaning on the wall, one foot back, holding a rose to his cheek. My photo, if I had been able to take one, would have been in black and white except for the rose, which would have been the deepest, richest red. I thought then of a time when a man met me at the bus depot with one red rose. Our relationship was teetering on the edge of a demise and I had agreed to visit him on my birthday in February so we could discuss our future if we had one. I arrived rumpled, tired and very glad to be off the bus, but as I walked into the depot, my heart lifted, for there, galloping across the floor toward me was my boyfriend with one…red…rose! He, unlike the young man in the airport, was not at all anxious or concerned about everyone watching for, at 6’6”, no one could miss his dash across the depot! Charmed? Yes, I was. A dozen red roses? Very good, but one perfect rose can make an even greater impression. Of course I’m speaking for myself. Happy Valentine’s Day! PS I once received a dozen red roses for training a rather difficult Appaloosa gelding. I earned every one of those! Last week I brought my two year old filly, Wildwood Mistral, in to begin her training under saddle. She's a quality filly, a reining prospect, with the conformation and pedigree to make a excellent reiner. Still, she won't excel with those attributes alone, as good as they are. Without a solid program of training, she might never enter a reining pen - or be as good as she can be! Although I have handled her since birth (in fact I attended her birth), and I cannot trivalize the importance of any and all experiences she has had up to now, Mistral is entering a new, crucial era of her life - under saddle. There will never be another more important time in her life. Mistral's performance career is a "clean sheet of paper" and what is written on it will be there forever. The responsiblity is mine and, as I do every time I start a colt, I am mindful of writing only good stuff on that paper. It can be difficult to "erase" negative experiences, so I try to keep that from happening. I would go so far as saying the first 3-6 rides (or works) are the most important ones in training. It's kind of like writing a novel - without a good beginning, the story fails. The next day, I bitted Mistral before we left the barn with a snaffle with no reins attached, led her out to the main arena, lunged her in the snow. It didn't take long before she wanted to quit. 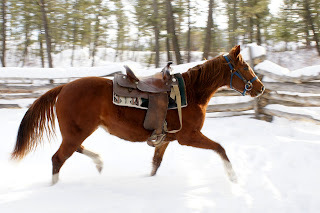 At that point, I led her to the round pen, which had not been used all winter and had two feet of snow in it. 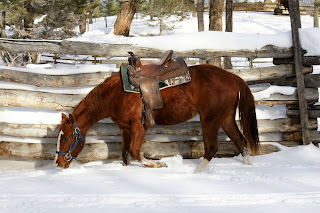 There I saddled her again (with some difficulty on my part in winter clothes, with a hurting shoulder and in the snow). Normally I would have had her on a lunge line at this point to control any bucking if it should occur. 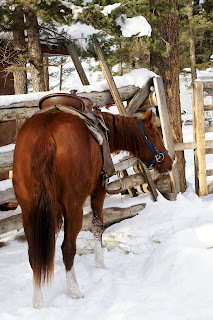 Since she could not move much in the stall the day before, I knew she might buck when she broke into a trot or lope. I would prefer to "shut down" any bucking but since I was awkward in the snow, I deviated from my usual program just a little. I did walk her a few steps, then took the shank off of the halter, stepped out of the pen, closed the gate, and picked up my video camera. Through the rails, this is what happened. After this very short "explosion", Mistral did not buck again. In fact, she followed me everywhere in the pen. I left her saddled and bitted for a couple of hours, then led her to the barn, still saddled, took the tack off, brushed her and turned her out. Day two. Another entry on that sheet of paper and again, with the exception of the bucking, all good stuff. She had moved around a lot with the saddle, had stayed out of any wrecks (me and her! ), carried a bit in her mouth and, most of all, learned that she had nothing to fear. Since these photos were taken, I have worked Mistral once more. I saddled her in the barn, led her to the round pen, free lunged her a little, stood at both shoulders and brought her head around with the rein a few times, then lunged her again. She did not spook, buck or jump. She's on the program. That clean piece of paper has something written on it now and I like what is there. I'm going to do everything possible to continue to "write" positive chapters. I thought I had a bad day yesterday. The thought that I had been pushing to the back of my mind all winter - that I would soon have to make that final trip to the vet with my dog - had hit me full force. For the past few months, I have been carrying Kirby (a Samoyed female) in and out of the house, settling her on a soft bed to soothe her old bones. I prepare special meals for her, rub her ears and give her hugs (which she gives me back). The night before last I bathed her. She fussed at first in the tub, but eventually relaxed. I think she most of all liked the fact that I was spending time with her. She is blind and this once-independent animal now depends on me for life. I am glad to do that for her and, thankfully, she does not know any different. Not every animal is so lucky. I said I thought I had a bad day yesterday. That's because today was worse. This morning, on Facebook, I learned of the slaughter of 100 sled dogs in Whistler BC. A few graphic details were included - enough for me to visualize a horrific, bloody scene - and even a video (which I have not watched). My stomach churned and I became physically ill. I could not get the picture of the dogs out of my mind - their terror, the owner who had betrayed them. And my mind went back to other stories of animal cruelty. Even in my chosen field - reining - I see and hear of cruel practices, practices that point out to me that the rider does not consider his horse capable of feelings. Imagine how I feel when that horse is one I raised! I can say with absolute certainty that I cannot even begin to understand the mind that believes that treating an animal with anything other than respect and empathy. Any animal - wild or tame - is a living, breathing, thinking being - with a soul! I also believe that this kind of mind could also harm another human being. If life means that little, nothing will stop it. I didn't really have a bad day yesterday after all. I still have Kirby and I will continue to care for her as long as I possibly can and as long as she is not in pain. I wish I had not opened up Facebook this morning and read this story, but I did; I wish I could do something about this but I can't; I wish I was proud to be part of the human race right now, but I'm not. The pain of those beautiful dogs is our shame.